Have you ever had trouble getting a gas-powered chainsaw started during wet, winter months? If so, you may have started wondering about what is the best electric chainsaw and is it up to the job of its fossil-fueled relations. This Makita UC4051A electric chainsaw review can help you answer that question. This is an especially powerful electric saw with performance output equivalent to a gas-powered chainsaw of the same size. The powerful 15-amp electric motor makes this saw entirely competent for tackling serious trimming and woodcutting jobs for homeowners, landscapers, and contractors. What Makes This Electric Chainsaw Rock! The Makita UC4051A electric chainsaw has an improved design over the earlier Makita UC4030A, which is now discontinued. Some of the improvements include more functional vents and a better chain adjuster than the earlier model. The motor in this electric chainsaw is a proprietary design developed by Makita and not available from any other manufacturer. This well-engineered motor is only one of the features making this among the best electric chainsaw makes. Larger trigger with a softer start makes powering up the saw smoother and easier. Tool-free, dial adjusting chain tensioner for fast adjustment of chain tension. Current-limiter built into the saw reduces electricity to the motor during extended use, preventing motor overload and overheating. Larger reservoir tank for bar oil and an easy-to-view window for visually checking level of bar oil. Bar oiling is also automatic. Handle grip with comfortable, rubberized surface is designed for good ergonomics and handling safety while working. A lack of anti-vibration engineering in the handles is one of the few drawbacks for the Makita UC4051A. This problem can be overcome by wearing anti-vibration gloves. This saw is at the high end of the cost spectrum for electric chainsaws with a 16 inch bar, although it is still a good value for the money. 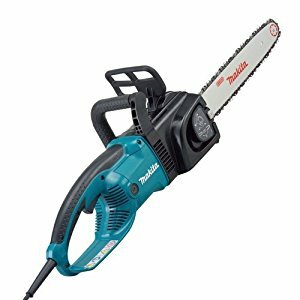 Q: What type of bars does the Makita UC4051A Chainsaw Use? A: The saw comes with a 16 inch bar. The bar is removable and can be interchanged with other bar types.Q: What is the maximum size tree this saw cuts? A: Cuts wood up to 14 inches in diameter. Q: What size electric cord do you need to power this saw? A: A 10 or 12 gauge cord is needed, depending on cord length. Q: Does it have a worm-drive or in-line hypoid drive system? A: A bevel gear drive is used. Q: What is the weight of the Makita UC4051A chainsaw? A: The saw weighs 12.3 lbs. when empty. The Makita UC4051A electric chainsaw is a powerhouse for its size. It is built with a motor made only by Makita especially designed for maximum power output, cutting capacity, and durability. This is a compact electric chainsaw suitable for any homeowner or professional who has more than a little chainsaw work to do. I like this electric chainsaw for its ability to tear through medium sized pieces of wood just like a gas-powered saw but without any hassles getting the equipment started and without the exposure to harmful fumes.